- 🎄【CHRISTMAS LASER LIGHTS WITH 5 PATTERNS 】- Newest Christmas laser lights with 5 patterns including snowflake, Jingling Bell, Christmas tree, santa claus, Starry. 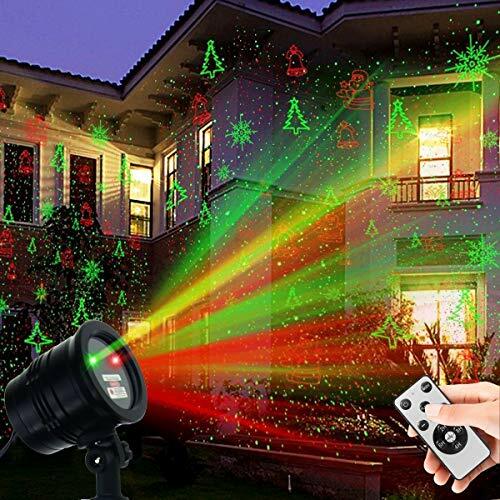 Red & Green laser blinking on the wall/ceiling/ lawn，can cover up to 3500sf from a distance of 49ft.Collocated with 300°adjustable projector head, it is quite convenient to aim the fairy light to the place where you are going to decorate. Perfect for Christmas ,holiday entertainment, parties, landscape decoration. - 🎄【POWERFUL RF REMOTE CONTROL】 Super easy to use and control. Compared to others, our RF remote controller is penetrating. 65ft barrier-free control, no point-to-point operation.You can freely set speed of moving stars by RF remote control.You can set timing (2H/4H/6H/8H on,22H/20H/18H/16H off) on this laser light that on at dusk and off at dawn，costs 80% less energy than other string lights ,no more need to run out in the winter. timing and You also can change different mode of patterns. - 🎄【UL LISTED & WATERPROOF】-Our Christmas projector lights is portable and in a small size.Approved by UL. Made of aluminum alloy with great heat dissipation and more high-end for this material.With High temperature sensing system, If the temperature is too high, it will be automatically powered off.The main body of this Christmas light is rated up to waterproof IP65, and the adapter rated waterproof IP44 which has rain and snow resistant,enabling you to place it outdoor.